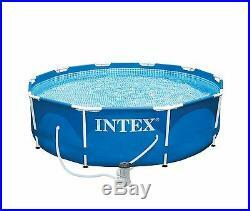 Intex 10 x 2.5 Foot Metal Frame Swimming Pool Set w/ Filter Pump + Debris Cover. Part Number: 28201EH + 28030E. Metal frame above ground pool set. An affordable and to to set up alternative to more complicated steel walled pools, and a more durable alternative to inflatable models. 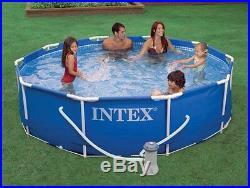 Intex's Metal Frame Set Pool provides both value and convenience for years of family enjoyment. The wall PVC material is Intex's super-tough, which is high molecular PVC unaffected by gasoline, oil, and salt water. The super-tough PVC is highly resistant to damage from abrasion, impact and sunlight. Intex 330 GPH Filter Pump is included to help keep your water sparkling clean. At a full 10 feet wide and 30 inches in height, the Intex Metal Frame Pool Set is ready for a big splash to help you enjoy the outdoors this season. Easy-to-assemble and maintain, this Metal Frame Set pool is great for having friends and family enjoy time outdoors, and it comes complete with filter pump and debris cover. This pool has easy and conveniently draining. The drain plug accepts a garden hose to drain water away. Also includes is a setup and maintenance instructional DVD included to help get you started. Plus, this set includes the Intex 330 GPH filter pump, a Type "H" filter cartridge to help keep your pool water safe and clean, and a 10-foot vinyl pool cover. Please note: Proper installation of any above ground pool requires an area, sufficiently larger than the desired pool, to be leveled flat. Uneven ground, hills or holes must be leveled before pool assembly begins. If severely uneven ground prohibits level ground, proper installation will not be possible. Also includes a Type "H" filter cartridge for the filter pump. Easy and conveniently draining: Drain plug accepts a garden hose to drain water away. Setup and maintenance instructional DVD included to help get you started. Includes 10 foot, round vinyl pool cover. Intex is the world leader in both designing and producing high quality, innovative products for indoor and outdoor recreation. Intex above ground pools, pool accessories, pool toys, airbeds, and boats are known around the world for their tremendous quality and value. All Intex products are rigorously tested and meet all international safety standards to provide years of fun for customers in over 100 countries throughout the world. Cancelling Your Order: Your order is important to us and will be processed immediately. Select the reason for the return. This listing is currently undergoing maintenance, we apologise for any inconvenience caused. The item "Intex 10 x 2.5 Foot Metal Frame Swimming Pool Set with Filter Pump + Debris Cover" is in sale since Thursday, July 24, 2014.